2015 has been a slow year for Callie so far, and even though we entered this summer with the best laid plans for lots of adventure, they kept falling flat. A series of Sierra storms, LA heat waves, family visits, wildfires, mosquitoes, and even the Grateful Dead’s final shows all conspired to keep Callie away from the mountains and more inactive than we’d like. Over the July 4th holiday weekend, we finally had a small window of time to get out and spend some time on the trail. With only a handful of hours of daylight, I needed to find something relatively short, and I settled on Mount Williamson as our target. I had never hiked up to the peak before, nor had I hiked the section of the PCT that makes up the majority of the hike between Islip Saddle and the summit. It also seemed just obscure enough to offer relative solitude on one of the most popular hiking weekends of the year. We reached the trailhead at Islip Saddle about 4 hours before sundown and began heading up the PCT. Callie’s last big hike was on the High Desert Loop which goes down the PCT for about 10 miles in the opposite direction, so it was nice to add some more perspective to this section of the trail while it was still fresh in our minds. The trail here is as amazing as one should expect for the PCT in this part of the San Gabriel Mountains. Evergreen forests, open desert views, cool(er) mountain air, solitude on a holiday weekend, what’s not to love? On the PCT’s final approach to the Williamson Saddle, the ease of the last section of the hike becomes apparent. Almost all of the elevation gain of the ascent is done on the PCT, and the use trail up to Williamson is an easy jaunt up the summit. At the saddle, there is a clear line of sticks meant to keep PCT hikers on the trail, and it also makes a good enough marker for those wishing to leave it. From here on out, the hike somehow becomes even more sublime. The grade of the trail evens out as it ascends the gradual slope of the Williamson ridge line, and tremendous views of the surrounding wilderness begin to open up. Basking in the late afternoon glow on the top of a mountain that we had all to ourselves, we paused to reflect on the city far below, with its omnipresent energy blocked by the fortress of wilderness lying in between. I am eternally grateful to live a life that allows me to escape to places like this. The top of Williamson is comprised of three different summit plateaus at a fairly equal elevation. Ironically, the official summit of Williamson is not the highest among them, which leads to some debate about which summit is the true summit. I don’t really care to be honest, but that wasn’t going to stop me from exploring the summit ridge and giving each of them a visit. We skipped the initial “official” summit plateau that the trail reaches as it hits the ridge line, and instead focused on traversing to the western edge of the ridge. Travel here continues to be predominantly quite easy, and now the views from the trail feature an extraordinary vista down towards the Devil’s Punchbowl, Lancaster Valley, and the endless expanse of the Mojave Desert. The contrast between the two sides of the mountain provides an interesting element to the hike. One view showcases the emptiness of one of the most desolate areas left in the lower 48, while the other looms over the sprawl of one of the biggest cities in the world. The one exception to the mellow nature of the ridge trail is a brief section that is steep and slippery. It’s easy enough if you tread carefully, and the rest of the ridge returns to the default pleasantness that the area is known for. The two western summits are fairly close together. We started out with the westernmost on the edge of the ridge, and were greeted with views of the surrounding peaks in the Pleasant View Wilderness. This area of the San Gabriel Mountains continues to impress me, and as we stood overlooking the remote wilderness I was already plotting future possibilities in the area. Next, we headed over to the middle summit, where the highlight was a fantastic view of Twin Peaks and the surrounding mountains. 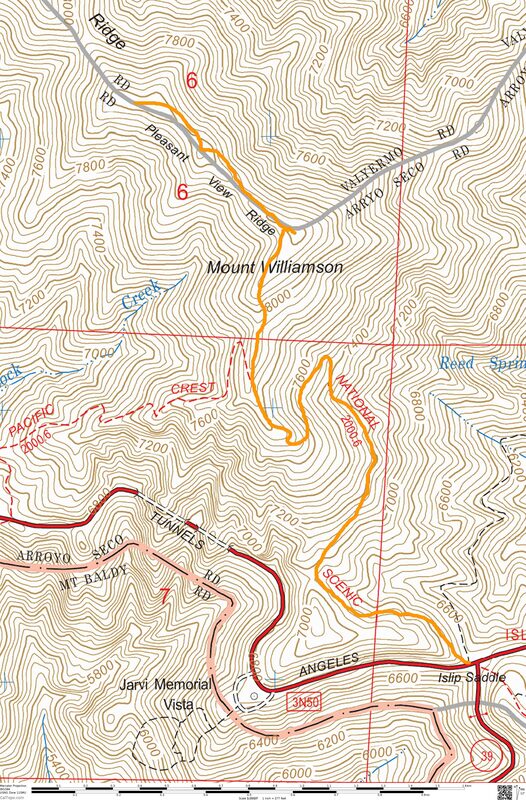 Their steep ridge lines juxtaposed so closely together clearly illustrates how rugged the San Gabriels can be. Even John Muir referred to the area as a place where “mother Nature is most ruggedly, thornily savage”, and went on to say that “the slopes are exceptionally steep and insecure to the foot of the explorer, however great his strength or skill may be.” My experience has led me to the same conclusion, which makes the ease of travel on Williamson and the Pleasant View Ridge feel that much more special. We returned on the ridge line to the official summit, intent on taking an extended break there to enjoy the view all to ourselves and have a bite to eat. I decided to go a bit gourmet for this occasion, and lugged up a chair, some wine, and a delicious spread of fresh food. The idea of having a fancy doggie date with a sunset view of the desert seemed just preposterous enough to be worth doing. Besides, the extra weight could easily be justified as backpacking training, the peak was empty which meant that we could enjoy our unusual behavior without getting double takes from socal peak baggers, and life is too short to not linger on top of a mountain every once in awhile. While I enjoyed the view and my spread of food, Callie proceeded to wolf down her Merrick Backcountry food that we brought up for her. As we mentioned a few weeks ago, Callie is an ambassador for the new Backcountry line of food. We haven’t had an opportunity to test it out in the trail, so this was our first chance and a worthy challenge. I have traditionally struggled to get Callie to eat any of her normal food while we are out on hikes. Sure, she’ll happily eat some of whatever food I have, but good luck getting her to eat a bowl of kibble in the middle of a long day hike. I’m not the only one who loses weight on backpacking trips either. She is a picky eater for a dog. The fact that she ate the food at all was a victory from my perspective. The fact that she did so while a bowl of food containing salami and cheese sat only a foot away confirmed she legitimately enjoys her new food. We are very comforted by the prospect of food that Callie will reliably eat on backpacking trips. The quality of ingredients and high calorie content of the raw infused food just serves to make it all the more appealing from my perspective, but ultimately, the best food in the backcountry is the food that you’ll eat. With dinner out of the way, Callie was quickly hit with itus, and we sat together basking in the last few rays of golden light hitting the mountain top. We headed down at sunset, and the soft glow of twilight helped light the trail for us until we got down to the Pacific Crest Trail, where I donned a headlamp to help us retrace our steps back to the car. Before the light completely vanished, a cloud in the distance glowed in a brilliant splash of red and orange to match the background sky. A series of ridge lines undulated beneath the cloud for as far as we could see, and in that moment it seemed impossible to fathom that this was Los Angeles. The wilderness here continues to defy our expectations, and we delight in each new discovery. Sweet thanks for this. I usually head up the other side of the tunnel. As always thanks ! Great Sunset Shot! Rick, do you mean you head up to Williamson via the other side of the PCT? Any reason why you normally choose that route? I also sometimes head up the PCT from the other side of the tunnel and I have a slight preference for that route. Also, if you want a little longer hike, starting from Eagle’s Roost and following the PCT (on Kratka Ridge) up to the tunnel is great. Congrats on the sponsor! Another great report! Nice report and excellent pics as usual. Williamson is a perfect location for a sunset wine, cheese, salami, and Merrick gourmet meal. Thanks, and we couldn’t agree more. We are do thankful you started this blog. We have a 17 lbs mutt that we want to bring on our hikes but wasn’t sure where to start. Since discovering your blog, we are so excited to combine hiking, quality time with our pet and sunset hikes. We just completed the Big Pine North Fork Trail To Lake 2 and it was simply amazing. Thanks again. Thanks for this. I really love hearing stories about how we have helped inspired other great dog adventures. This is my first time reading your blog. I recently took my dog on the Lost Coast Trail and we both loved it. Now I’m looking for more trails we can do off-leash. Are you “legally” hiking off-leash with your dog? Yes in the Sierra. No in the LA area.